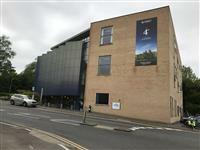 This Route starts at the Library/Learning Centre and runs to The GSA (Guildford School of Acting) Building, Via the Performing Arts Technology Studio Building, the Engineering for Health Building, Twyford Court, the 5G Building and the Ivy Arts Centre. This route is approximately 500 meters long. Related link Performing Arts Centre (PATS). Related link Estates and Facilities Management (Block EFM). 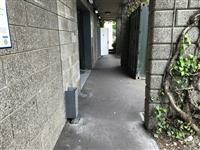 Related link Twyford Court Residences. Related link Ivy Arts Centre (Block IAC). Related link Library (Block LLC). You are on Exit the library, turn right and head towards the roundabout. Skip to the next section. 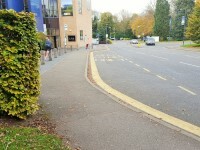 As you leave the library through the main entrance, turn right and begin to head down the hill towards the roundabout. 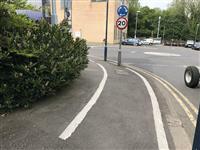 At this point there is an easy slope heading down towards the roundabout. 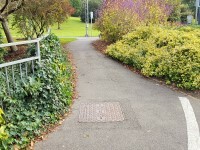 About 25 meters from the library entrance, the path weaves round to the right and then to the left. 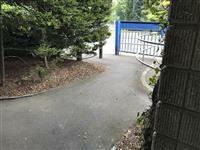 Follow the path as it weaves round and under a canopy as you come up to the roundabout. 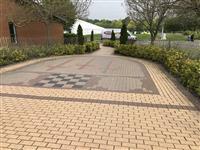 The surface is of the path ranges from tarmac to paving slabs. 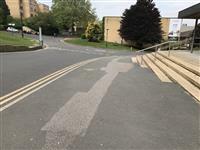 As you approach the roundabout, and pass the steps leading up to the Library ground floor entrance on the right, the path surface becomes tarmac, and as a steep gradient leading down. You are on At the roundabout, turn right and head down the hill. Skip to the next section. At the roundabout, turn right and follow the path down the steep hill. The path has a smooth tarmac surface. 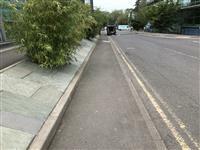 After 30 metres, the gradient shallows and the surface becomes blocked paving that is mostly smooth but uneven in places. 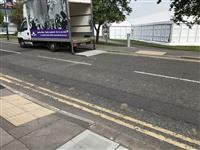 There is also a dropped kerb here, without tactile paving (photograph 3). Cross the road to the PATS Building. 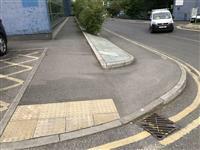 There is a dropped curb as you leave the road and this one does have tactile paving (photograph 5). You are on Continue to follow the path down the hill and turn left at the second roundabout. Skip to the next section. Follow the path for 20 meters until it bends round to the left. 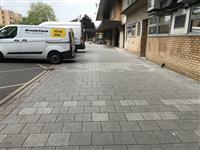 The path at this point has a block paving surface and a steep gradient. As the path bends round to the left, the gradient then begins to level out. 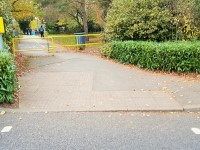 As you come to the bottom of the path, the surface is paving slabs which is uneven in places. Begin to follow the path along the side of the road. You are on Continue straight down the road, past the PATS building and path to Twyford Court. Skip to the next section. Continue to follow the path along the side of the road. 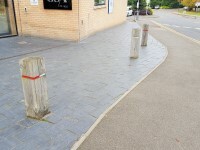 The start of the path has an uneven slabbed surface but 35 meters from the start of the path, the surface changes to a smooth and level tarmac surface. As you follow this path, on the left is the PATS Building (Please see PATS Building access guide for access information). 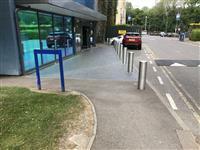 Towards the end of the PATS Building, there is a dropped kerb with tactile paving on both sides (photograph 3). 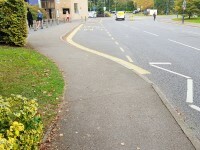 To access Twyford Court Residences, cross the road here, and continue roughly straight ahead, along the tarmac path to the residences (photograph 4). You are on From PATS, continue along the path, past the Engineering for Health Building and 5G Building. Skip to the next section. As you pass PATS, continue along the path along the road and past the Engineering for Health Building, which is on the left hand side (please see the Engineering for Health Building access guide for access information). Just past the Engineering for Health Building, there is a road crossing. 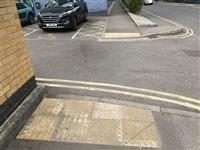 There is a dropped kerb either side of the road with tactile paving. Once you have crossed the road, continue to follow the path past the 5G Building which is to your right on the opposite side of the road. The path now has a rough tarmac surface that is uneven in places. 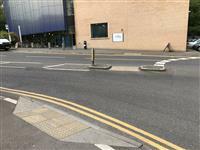 To cross the road to the 5G Building, there is a dropped kerb with tactile paving on both sides (Please see the James C Maxwell Building access guide for access information). You are on Continue along the path, past International House. Skip to the next section. Carry on straight down the path until you reach a road crossing outside International House. 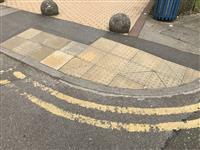 Both sides have a dropped kerb and tactile paving. The path splits into 2 at this point. Take the path to the right and follow it past the front of International House for 70 meters until you reach the IAC Building. You are on Continue along the path past the Ivy Arts Centre to the end of the path. Skip to the next section. Once you come up to the IAC Building, the surface temporarily changes to a smooth block paving surface which is uneven in places and slopes towards the building. Continue to follow the path in front of the building as it weaves around the pillars. 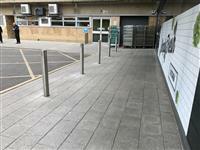 At the end of the building there are 2 medium height steps which lead up to the road. 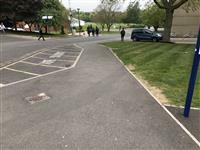 However, before getting to these steps there is a right turning with an easy slope which also leads you round to the road and bypasses the steps. 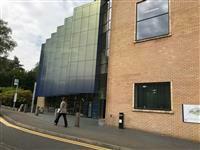 You are on Cross the road to the GSA building (Non Pelican Crossing). Skip to the next section. 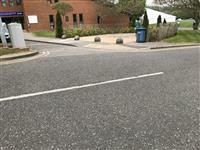 As you come to the road crossing the path has a smooth tarmac surface and a slight slope towards the road. 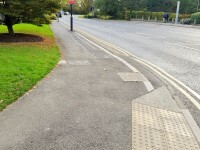 The road has a dropped kerb either side with tactile paving. 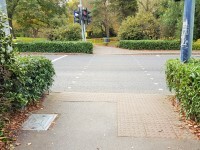 Since this is a busy road, there is an island in the middle that also has tactile paving. 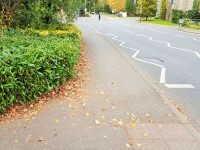 Once you have crossed the road, there is an easy slope heading up to the building. 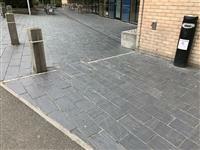 The path then changes from a rough tarmac surface to uneven slate tile paving. 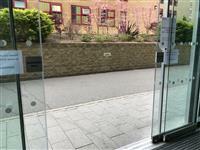 Please see the GSA Building access guide for more access information. 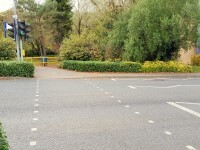 It is recommended that the pelican crossing is used to cross this road, as it can get busy. You are on Continue along Perimeter Road to the Pelican Crossing. Skip to the next section. 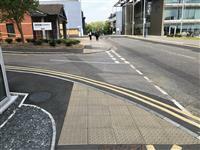 At the first crossing, continue to follow the path to the left up the hill to the pelican crossing. This path has a tarmac surface, uneven in places, with a molderate to steep gradient. Just before the crossing, the path veers away from the road and narrows to approximately 145cm wide. 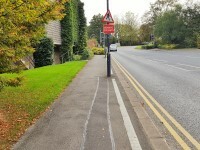 Care should be taken as this path is also a cycle path. You are on Cross Perimeter Road. Skip to the next section. 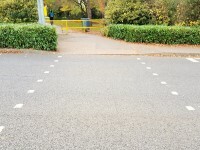 After approximately 40m, turn right to reach the crossing. 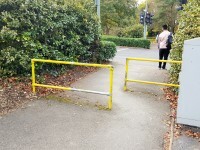 There are barriers to access the crossing, with a maximum width of 104cm. The crossing has dropped kerbs and tactical paving on both sides. 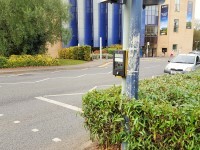 The buttons for the pelican crossing are 124cm high. Road has a tarmac surface with an easy slope leading up. You are on Continue Back Along Perimeter Road to the GSA Building. Skip to the next section. After crossing Perimeter Road, immediately turn right and follow the tarmac path down the steep slope, around the bus stop. This path is 157cm at its narrowest. 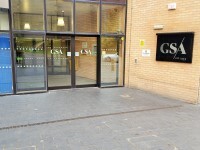 After approximately 32m, past the bus stop, turn left, down the slate tile surfaced slope with an easy gradient, to the GSA Building entrance. Please see the GSA Building access guide for more access information.